If selected, horizontal/vertical axis coordinates are logarithmic, otherwise they are linear. If selected, horizontal/vertical axis coordinate axes run in the opposite direction to normal. If selected, the number of pixels per unit is always the same on both axes, i.e. the unit square is always a square. Otherwise, there is no constraint on the relative sizes of the X and Y axis units. Normally, dragging with the left/right mouse buttons or using the mouse wheel on the main part of the plot will pan/zoom it in both X and Y directions. 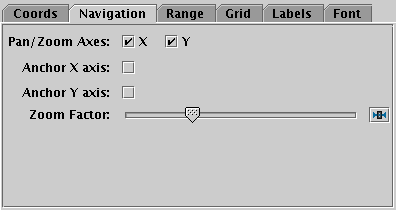 By unchecking the X or Y checkbox here, you can prevent pan/zoom in the corresponding direction, so if the Y box is unchecked, pan/zoom will only affect the vertical direction (note the same effect can be achieved by dragging to the left of the Y axis). Normally, zoom operations zoom around the position of the mouse at the start of the wheel/drag gesture. Checking these boxes fixes the X/Y reference coordinate for zooms to be the Y=0 or X=0 lines. This can be useful if you want the X or Y axis to stay put (e.g. at the edge of the plot) during zoom actions. Controls the factor by which each zoom action zooms the plot. Moving this slider to the left/right makes the mouse more/less sensitive (one wheel click or dragging a fixed distance has more/less zoom effect). 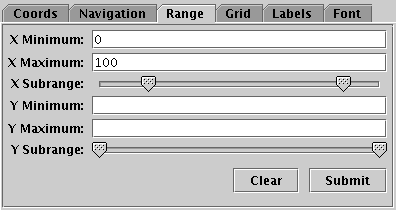 The Range tab provides manual configuration of the visible range of the plot. 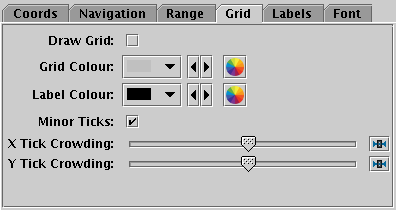 Making changes to this tab will reset the visible plot range, but not vice versa - zooming and panning in the usual way will not change the settings of this panel. Filling in the Minimum/Maximum fields for either or both axes will constrain the corresponding range of the visible data. The limits corresponding to any of those fields that are left blank will initially be worked out from the data. The Subrange double-sliders restrict the ranges within the (explicit or automatic) min/max ranges. Note you can move both sliders at once by grabbing a position between the two. The Clear button resets all the fields. 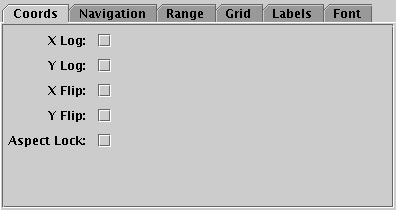 The Submit button updates the plot with the current values in this tab, as does making any changes to it. If true, grid lines will be drawn across the plot for every tick mark. Selects the colour with which grid lines will be drawn. Selects the colour in which axis label text will be written. If set, minor (unlabelled) tick marks will be drawn between the major (labelled) ones. Use the slider to influence how many tick marks are draw on each axis. 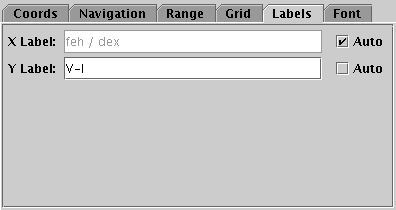 The Labels tab controls the text labels on the axes. If the Auto checkbox is set, the text will be taken from one of the data coordinates being plotted on that axis. To override those with your own axis labels, unset Auto and type text in to the Label fields. The Font tab configures the font used for axis annotation. It also affects some other things like the legend. How to turn the text into characters on the screen. Plain and Antialias both take the text at face value, but Antialias smooths the characters. Antialiased text usually looks nicer, but can be perceptibly slower to plot. At time of writing, on MacOS antialiased text seems to be required to stop the writing coming out upside-down for non-horizontal text. LaTeX interprets the text as LaTeX source code and typesets it accordingly. Size of the font in points. Whether the font is plain, bold or italic.